As we hurdle ever closer to the holidays and the end of the year, there’s lots of plants we could talk about – amaryllis, poinsettias (and the abuse thereof with glitter and paint), whether or not your cactus celebrates Thanksgiving, Christmas, Easter or is agnostic, and on and on. Each of these plants have an interesting history and connection to the holidays, but today we’re going to be a little more naughty…but nice. We’re going to talk about mistletoe. Now, mistletoe is one of those holiday plants that you don’t really want growing in your own garden. That’s because, even though it is a symbol of love and even peace, it truly is a parasite … and poisonous. It has been celebrated and even worshipped for centuries, and still has a “naughty but nice” place in holiday celebrations. Burl Ives, as the loveable, banjo-playing, umbrella-toting and story-narrating snowman in the classic “Rudolph the Red-Nosed Reindeer” claymation cartoon tells us that one of the secrets to a “Holly Jolly Christmas” is the “mistletoe hung where you can see.” But where does this tradition of giving someone an innocent (or not-so-innocent) peck on the cheek whenever you find yourselves beneath the mistletoe come from? And just what is mistletoe anyway? Distribution of mistletoe (and mistletoe specialist birds). Source: Mistletoe Seed Dispersal. Watson, D.M. There are around 1500 species of mistletoe around the world, mainly in tropical and warmer climates, distributed on every continent except Antarctica. In North America, the majority of mistletoe grows in the warmer southern states and Mexico, but some species can be found in the northern US and Canada. A wide variety of birds feed on the berries of mistletoe and thus disperse seeds. These birds include generalists who opportunistically feed on mistletoe, and specialists who rely on the berries as a major food source. First, we’ll cover the not-so-romantic bits of this little plant. Mistletoe is a parasitic plant that grows in a variety of tree species by sinking root-like structures called haustoria into the branches of its host trees to obtain nutrients and nourishment. It provides nothing in return to the tree, which is why it is considered a parasite. Mistletoe grows and spreads relatively slowly, so it typically does not pose an immediate risk to most trees. 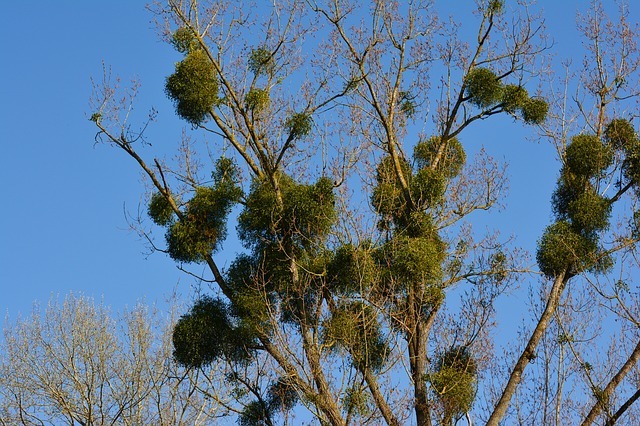 While a few small colonies of mistletoe may not cause problems, trees with heavy infestations of mistletoe could have reduced vigor, stunting, or susceptibility to other issues like disease, drought, and heat. So be on the lookout for mistletoe in your trees and monitor it’s progression. This little plant does have a long and storied history — from Norse mythology, to the Druids, and then finally European Christmas celebrations. Perhaps one of the most interesting things about the plant is the name. While there are varying sources for the name, the most generally accepted (and funniest) origin is German “mist” (dung) and “tang” (branch). A rough translation, then, would be “poop on a stick,” which comes from the fact that the plants are spread from tree to tree through seeds in bird droppings. In Norse mythology, the goddess Frigga (or Fricka for fans of Wagner’s operas) was an overprotective mother who made every object on Earth promise not to hurt her son, Baldr. She, of course, overlooked mistletoe because it was too small and young to do any harm. Finding this out, the trickster god Loki made a spear from mistletoe and gave it to Baldr’s blind brother Hod and tricked him into throwing it at Baldr (it was apparently a pastime to bounce objects off of Baldr, since he couldn’t be hurt). Baldr, of course, died and Frigga was devastated. The white berries of the mistletoe are said to represent her tears, and as a memorial to her son she declared that the plant should represent love and that no harm should befall anyone standing beneath its branches. The ancient Druids also held mistletoe in high esteem, so high that it could almost be called worship. During winter solstice celebrations, the Druids would harvest mistletoe from oak trees (which is rare — oak is not a common tree to see mistletoe in) using a golden sickle. The sprigs of mistletoe, which were not allowed to touch the ground, would then be distributed for people to hang above their doorways to ward off evil spirits. While the collecting and displaying of mistletoe was likely incorporated into celebrations when Christmas became widespread in Europe in the third century, we don’t really see mention of it used specifically as a Christmas decoration until the 17th century. Custom dictates that mistletoe be hung in the home on Christmas Eve to protect the home, where it can stay until the next Christmas Eve or be removed on Candlemas (which is Feb. 2). The custom of kissing beneath the parasitic plant isn’t seen as part of the celebration until a century later. Whether or not your housemaids will be in peril, the hanging of the mistletoe can be a fun Christmas tradition. Look for it at garden centers and Christmas tree lots this season. Or maybe you can find some growing wild and harvest it for your own decor. However, I would recommend not getting it out of the trees the “old Southern way” — shooting it out with a shotgun. Native vs. non-native – that a subject that is brought up frequently on our forums and one we have to discuss at length. However, I thought I’d take it from a different direction this week, a little diversion if you will, seeing as we are just a week away from our American celebration of Thanksgiving that centers around food – much of it native to the United States. It is a holiday that is quintessentially American (or North American, since our Canadian friends also have their own Thanksgiving). A commemoration of not only the arrival and survival of the pilgrims in Plymouth in 1621, but of our thankfulness for what we have. It is a time for us to gather with family or friends and reflect upon our blessings. While, much to my chagrin (and that of many others), Thanksgiving seems to have been swallowed up by the Christmas “season” and you can even go shopping for more stuff (an abomination, for sure) on a day when we are supposed to be thankful for what we have, it is still a day celebrated by many. Turkey, dressing, potatoes, fresh bread rolls and pumpkin pie are the traditional fare for the celebration these days, but they are a far cry from what the original feast shared by the pilgrims and American Indians would have featured. Historians agree that, while the feast was probably meat-heavy, turkey was probably not on the menu. It just wasn’t as popular a food item as it is today. Most agree that the original feast featured venison, with some waterfowl (goose or duck) and seafood (shellfish like oysters are a definite, maybe even eels or other shellfish). I don’t think I’m alone in saying that I like the side dishes better than I like the actual turkey. There’s the dressing (or stuffing, depending on your preparation or colloquial terminology), mashed potatoes, sweet potatoes, and my aunt’s seven-layer salad that’s usually more mayo and bacon bits than vegetation. The produce dishes at the first Thanksgiving would have been vastly different than the modern day smörgåsbord that we prepare. Experts agree that the majority of dishes would have been from native plants and indigenous crops grown by the local tribes, with a few ingredients showing up from the pilgrims’ gardens. First off, the absence of wheat flour, sweetener and flour would mean the lack of the classic dessert…pumpkin pie. It is hard to imagine a lack of pumpkin while we live in a time in which we are surrounded by pumpkin spice everything (though mostly artificially flavored). Sugar would have been too expensive to purchase for the voyage, and other sweeteners would have been limited to maple or other tree syrups. (Colonists had not yet brought over the honey bee, which is a European immigrant itself). This is not to say that there wasn’t squash. There were squashes, including pumpkins, as part of the native diet at the time having spread from their origins in Mexico and Central America . They were likely included in the feast, but either boiled or roasted, and unsweetened. Beans would have probably been one of the dishes, as well. The Natives Americans ate beans both in dry and green form, but at a fall feast, the beans were likely the dried variety and cooked into a soup or stew. Corn was also a feature of the first Thanksgiving, but not sweet corn (which didn’t make an appearance until much later). The corn would have been a flint type (similar to popcorn) that would have been cooked into porridge or used as a bread. Native tree nuts, such as walnuts, chestnuts and beech nuts could have also been used in the preparation of dishes. There isn’t any written record of the native cranberry or blueberry being used, either, but they would have been abundant in the area. They likely wouldn’t have caught on in popularity until sweeteners such as sugar from Europe or honey was available to dull their acidic bite, but the dried fruits could have been used in preparations of some of the meat. If there was a salad, watercress could have been used if an early frost hadn’t wiped it out. The pilgrims had brought with them from Europe various seeds, including herbs and onions, that could have been used to flavor some of the dishes. They may have also brought things like turnips and carrots that could have been available for the first feast (though there isn’t any direct written proof). One native food that would have most likely been on the first Thanksgiving table is the sunchoke (Helianthus tuberosus), or Jerusalem artichoke. Fallen out of favor for some time, the sunchoke is making its return to many gardens. So as you sit down for your Thanksgiving feast, be thankful for the blessings in your life and for the leaps and bounds our food options have improved over the past 400 years. Also be thankful for butter, flour, and sugar so you can have your pumpkin pie.